Beach sprints are huge for burning belly fat. They are fully endorsed by Mark Sisson, the guru of caveman/Paleo eating and author of the Primal Blueprint, to increase muscular definition. Obviously, this short article is aimed at guys who live close to a beach. Since I live 15 minutes from the Florida Gulf Beaches west of St. Petersburg, beach running on Treasure Island is a natural for me. Ladies, I am not trying to intentionally leave you out because, in reality, I see far more women training hard when I run on the beach, than I do men. 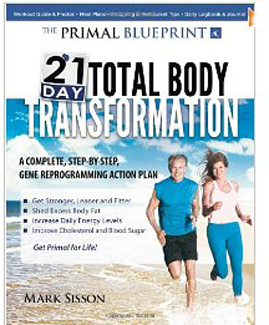 As a matter of fact, Mark Sisson's newest best-selling book, The Primal Blueprint 21 Day Body Transformation, is actually purchased by equal numbers of women. I am mainly speaking to men because far too many of them have let themselves go, eat too much crap food, blow-off working out so they can watch TV or mess around on the computer, and wonder why they carry love handles and belly flab. Guys, the women reading this can tell you that male belly fat does NOT excite them one bit. Do you really think they want to go to bed with a guy built like a manatee? Beach sprints can help you shed belly fat more quickly, but they are just part of a solid fitness plan. Eating consciously, with a focus on natural foods, strength training (including weights), and doing some form of cardio most days are the other critical elements that need to be included. Fortunately, Mark's excellent book addresses these factors in a concise and easy to integrate manner. You can't jump right into sprinting, especially on the beach. It is much different than running on a 400m track or asphalt. Start very gradually. My recommendation is to run about a month (3 times per week), real easy...working up to a couple of miles, before integrating beach sprinting into your workouts. * Warm-up and stretch before starting your sprint sets. This is not a blow-off activity. Beach sprinting needs to be taken seriously. * Run early and at low tide, if possible. Dodging tourists, and trying to sprint on soft sugar sand (at high tide) is not a lot of fun. * Keep in mind you will be running on uneven surfaces. The slant of the beach at low-tide plays a role, and so does the soft sand if you have to go at high-tide. Knees, hips, and ankles can easily move in directions that put them in harms way. * Wear old shoes. Sand and sea-water tear up shoes. They accelerate wear. Some runners wear Vibram FiveFingers Classics, but I have never tried these. I do know that Mark Sisson swears by them for beach workouts. * Forget about running barefoot. I know, running barefoot sounds real romantic, and visions of Pamela Anderson sprinting in slow-mo on BayWatch can have a motivational effect on your training...but broken sea shells, beer pop-tops, and fish hooks, can put a dent into those thoughts real quickly. * Be prepared for your toes and arches of your feet to cramp painfully while you sleep when you first start beach running. Stretch faithfully, eat an extra banana, and stay hydrated to help relieve this. * You CANNOT run-off or exercise-off enough calories to lose belly fat. You must make a significant and positive change in your eating habits. Mark Sisson's best-selling book can really help you, here. * Do not do sprint workouts two days in a row. Give yourself at least 72 hours between these intense sessions. * Stay extremely focused when doing sprint intervals. Watch for tourists crossing your path and watch for small obstacles in your path. * Drink plenty of water afterward. Plus, I always make sure I bring a banana or an apple, and a grilled chicken breast to eat a bit later. 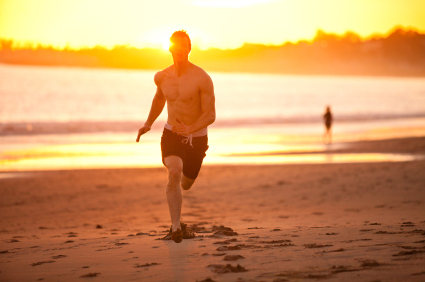 Beach sprints are at the top of the list to help you get rid of belly fat and become more muscular.